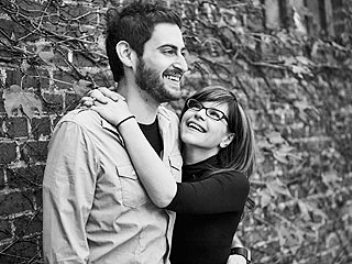 Lisa Loeb Married Roey Hershkovitz Today. Congratulations to singer/songwriter Lisa Loeb who got hitched on Saturday at the age of 40. In a traditional Jewish ceremony, Loeb exchanged vows with Roey Hershkovitz, a music supervisor for Late Night with Conan O’Brien, in front of 275 guests. Lisa Loeb’s rep Janet Billig Rich told People magazine that the wedding took place at a restaurant in New York where the bride wore a strapless pink wedding gown by Amsale Blue Label and the groom wore a suit by Paul Smith. The newlyweds met two years ago during a business meeting in New York City; Hershkovitz was developing a food show and looking for someone to host it. They got engaged last November. During the reception the guests were treated to a buffet-style dinner of Caesar salad with anchovy beignets and jumbo lump crab cakes from chef Julian Alozno. The wedding cake was a white cake with chocolate mousse, created by pastry chef Martin Howard. Lisa Loeb said she wanted her guests to “come in from the cold to a cozy winter wonderland” so designers Sherri Adler and David Sawaryn created a beautiful feel with all-white centerpieces arranged in a variety of glass and copper vases, and accents of fresh moss and little deer figurines. All of the flowers form the wedding will be donated by the couple to the FlowerPower Foundation run by Nancy Lawlor; an organization that collects donated flowers and turns them into arrangements for the elderly and terminally ill.
next post: Who Won The Super Bowl? Get The 2009 SuperBowl Score.